So You Wanna Build a Crowdfunding Site? The tools to get funded by the crowd should belong to the crowd. That's why I want to show you how to roll your own crowdfunding site, in less than 300 lines of code. Everything in this tutorial is open source, and we'll only use other open-source technologies, such as Node.js, MongoDB, and Balanced Payments. All source code and tutorial text is Unlicensed. If you just want the final crowdfunding site, clone the crowdfunding-tuts repository and go to the /demo folder. All you need to do is set your configuration variables, and you’re ready to go! For everyone who wants the nitty gritty details, carry on. which just serves a basic homepage and funding page for your crowdfunding site. Create another file named fund.html. This will be your funding page. so that your site doesn’t look Hella Nasty for the rest of this tutorial. Finally, run node app on the command line to start your server! 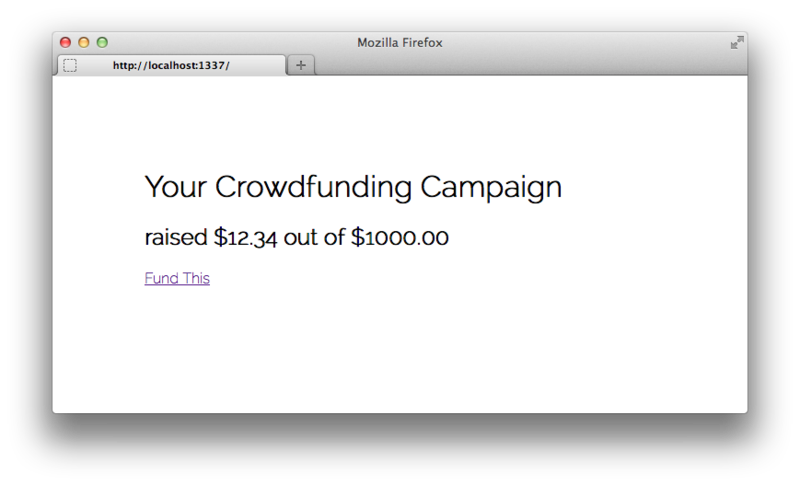 Check out your crowdfunding site so far at http://localhost:1337. The homepage will display the Campaign Goal you set in the Configuration section of app.js. The donations page isn’t functional yet, so in the following chapters, I’ll show you how to accept and aggregate credit card payments from your wonderful backers. Balanced Payments isn’t just another payments processor. They’ve open sourced their whole site, their chat logs are publicly available, and they even discuss their roadmap in the open. These people get openness. Best of all, you don’t even need to sign up to get started with Balanced! that you can claim with an account afterwards. Remember to keep this tab open, or save the URL, so you can come back to your Test Marketplace later. Click the Settings tab in the sidebar, and note your Marketplace URI and API Key Secret. Now, let’s switch back to fund.html to create our actual payment page. // Get card data from form. Restart your app, (Ctrl-C to exit, then node app to start again) and go back to http://localhost:1337. The default values for the form will already work, so just go ahead and click Pay With Credit Card. 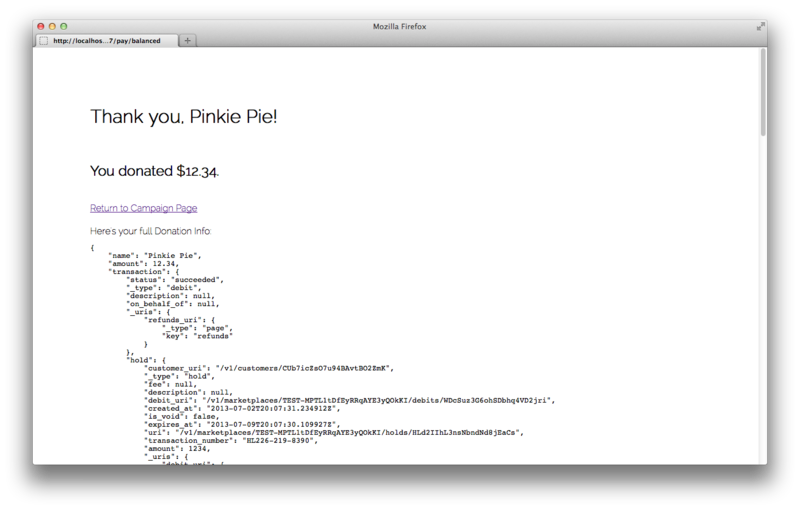 (Make sure you’ve replaced BALANCED_MARKETPLACE_URI in fund.html with your actual Test Marketplace’s URI!) Your server will happily respond with the generated Card URI Token. Next up, we will use this token to actually charge the given credit card! Before we charge right into this, (haha) let’s install two more Node.js modules for convenience. # A library for simplified HTTP requests. A Promises library, to pleasantly handle asynchronous calls and avoid Callback Hell. amount: transaction.amount/100, // Convert back from cents to dollars. Now restart your app, and pay through the Donation Page once again. (Note: To cover processing fees, you have to pay more than $0.50 USD) This time, you’ll get a full Payment Complete page, with personalized information! Furthermore, if you check the transactions tab in your Test Marketplace dashboard, you should find that money has now been added to your balance. We’re getting close! Next, let’s record donations in a MongoDB database. MongoDB is a popular open-source NoSQL database. NoSQL is especially handy for rapid prototyping, because of its dynamic schemas. In other words, you can just make stuff up on the fly. This will be useful if, in the future, you want to record extra details about each donation, such as the donator’s email address, reward levels, favorite color, etc. Start up a MongoDB database, and get its URI. You can use a remote database with a service such as MongoHQ, but for this tutorial, let’s run MongoDB locally (instructions for installing and running MongoDB on your computer). Once you’ve done that, add the MongoDB URI to your Configuration section at the top of app.js. Add the following code to the end of app.js. 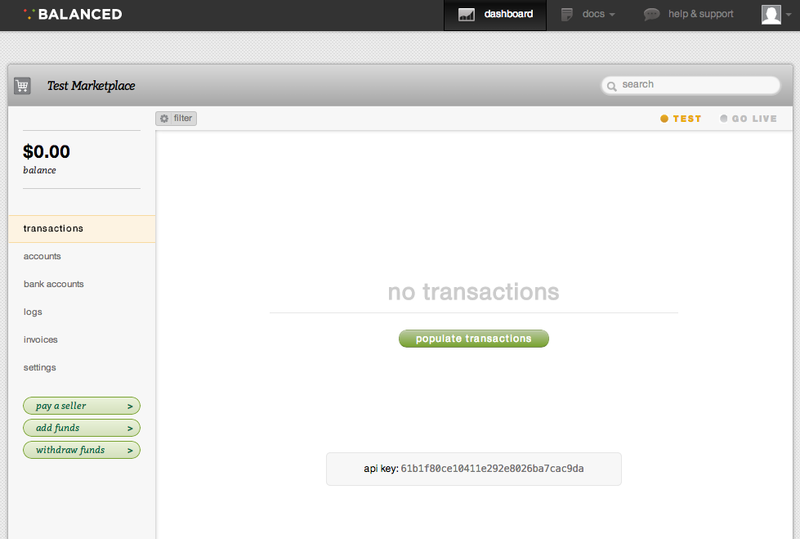 This will return a Promise that we’ve recorded a donation in MongoDB. 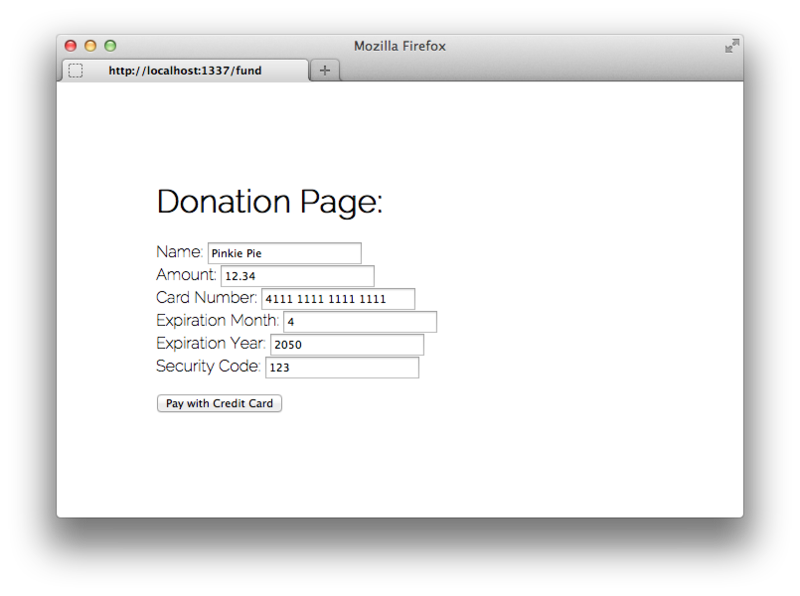 Previously, we skipped over actually recording a donation to a database. Restart your app, and make another donation. If you run db.donations.find() on your MongoDB instance, you’ll find the donation you just logged! Finally, we will use these recorded donations to calculate how much money we’ve raised. Whether it’s showing progress or showing off, you’ll want to tell potential backers how much your campaign’s already raised. // Sum up total amount, and resolve promise. Now, let’s go back to where we were serving a basic homepage. Let’s change that, to actually calculate your total funds, and show the world how far along your campaign has gotten. Restart the app, and look at your final homepage. You’ll see that your total already includes the donations recorded from the previous chapter. Make another payment through the Donations Page, and watch your funding total go up. Congratulations, you just made your very own crowdfunding site! Thiel Fellow & Mozilla WebFWD alumni. Crowdfunding the creative commons with Commonly.cc. Woot! Amazing guide that I still need to go trough, but definitely lots of love for putting this together. Going to share this on my blog! Hey glad to read this article thanks for posting it. I like to use Mozilla but it is crashing if i open more than 10 urls why it is happening? i used to analyse coding by Firefox browser but because of getting stuck not able to do it….. Please can you make it faster than chrome!! Sounds like you’re encountering a specific issue. Please contact the Firefox support for that. Good to hear that it was inspiring! Very cool! I will have to try this demo. Thanks for the great post! Great tutorial. It’s a shame balanced payments is not available worldwide. Love the promise part in this example, just need a good case help me understand this, thanks a lot!! Very good read. Thanks for sharing this one. I think it should be mentioned that if you are going to be sending credit card information to your own server YOU NEED TO USE HTTPS! I realize this is an example, and that this is mostly here to learn the flow of processing credit cards, but if you are planning on using this in production you need to make sure your server is secure. That being said, this is a great example. I had never heard of balanced and now I am definitely going to use them in my project. Thanks! As a learning exercise, I enhanced this a little bit by using templates, jquery and also added bootstrap css.